"It don't take money, and it don't take fame. Don't need no credit card to ride this train. Tougher than diamonds and stronger than steel. However, in our case, we're talking about the power of CODE! What a fabulous week we have had at our tiny but mighty K-8 school. 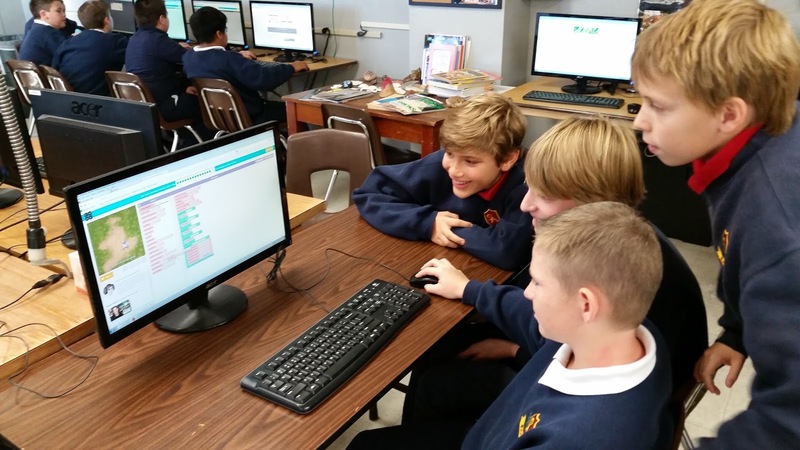 Students at all grade levels participated in our Hour of Code event. I missed this last year and have been a bit of a late-comer to some of these types of events. As the time neared, I looked up information, began sorting through resources, registered our event, and geared up with the students for what I hoped would be an interesting time of learning for everyone. 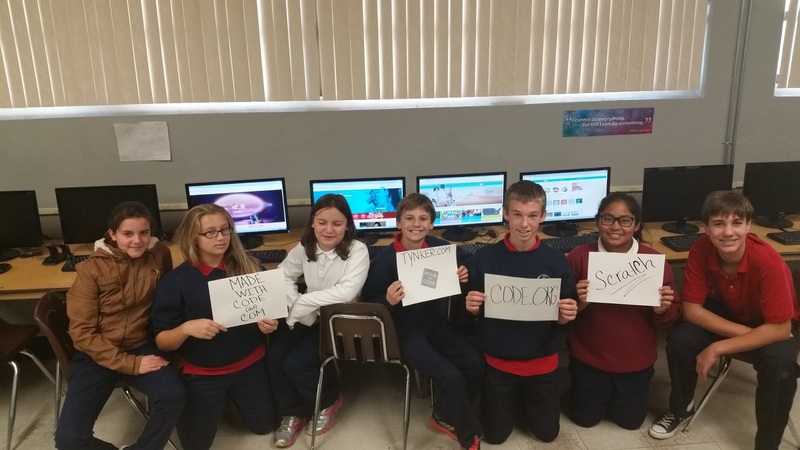 I introduced the seventh and eighth grade students to the idea of coding first. I thought that this would help in the event I needed back-up with some of the other classes. It did even more than I could have imagined. But, I want to save my big story for later in this post. As the time neared and as I shared the idea behind the Hour of Code to more and more students, I admittedly remained a bit hesitant with the idea of introducing coding to my kindergartners. I knew that technically it could be done. I knew the tutorials on CODE(dot)ORG even made it look possible. I even knew that I fully intended to try it at home with my very own kindergartner. Finally, I decided to blast myself through any fears and concern and hesitation I might have and give it all she's got, Captain. I knew the best time to introduce our kindergarten students would be on a Friday when I had them in small groups of about five. I knew I wanted to make myself available to help each student as needed. My role would be a supporting role, but an important one for these students in particular. I had a group of five kindergartners come in and sit down at computers. I explained that we were going to learn how to communicate in computer language, that they were going to learn how to run a program like one of the activities we did every week. I also explained that they would be able to go on to another activity after 10 minutes if they chose to do so. I knew that some may get frustrated and need a break and with o ur limited time, I wanted to make sure that they were more engaged than frustrated. That was key. I worked with half of the kindergarten class one day and half another. The first day got me so excited. I watched as students tried and met with both successes and failures, but they learned from all results. They tried again. Yes, they got frustrated every now and then, but overall, they were engaged and learning and trying and doing. After awhile, one by one they shifted to other things. All except one. I was blown away by her patience and her desire to stick with what she had started. I called over the kindergarten teacher to show her what I was witnessing, what one of her students was accomplishing. It was a moment of celebration and joy. And this was not the only kindergarten student to demonstrate such patience as she navigated through a series of early reader tutorials and Angry Birds coding. A note will go home with students so that they have a chance to access activities at home with their parents too. Meanwhile, back at home, my own kindergartner gave her best shot to the Elsa/Anna tutorial. She walked away on level six -- the same level where even eighth graders grew frustrated. But eventually, she got it. In fact, every single person I have watched hit a peak of frustration with the sixth level on that tutorial has eventually figured it out, succeeded, and moved forward. Success! I went home at night only to continue what I had spent my day at work doing, just in a more one-on-one format with my two children. Then, once they settled in for the night, I had interesting conversations with my dad...the guy who once worked as a programmer. This is the guy who wrote one of my favorite computer (math) games when I was a kid. Multi-generational programming and coding conversations following a day of coding successes! Huzzah! Success is the theme that seemed to repeat itself again and again. I have all grade levels that I teach, but I only see them a maximum of three times during the week. I had to get a little creative with making sure everyone had a chance to explore the coding exercises, but absolutely every student had a chance to experience these lessons. And success after success happened. Students celebrated. Now, back to the big story. I had one seventh grader who came in every day after school. He reported back to me daily about his coding experiences at home. He requested additional resources, and he found some on his own. 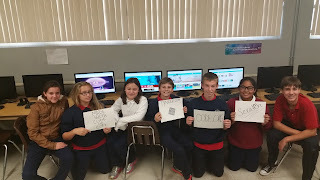 When all was said and done, this student logged over 50 hours of coding! Another student in his class shared with me one day about telling his mom about Hour of Code. He went on to say, "she's teaching me to code," referring to me as he continued to recount the story. I stopped. I looked around. I understood what he was saying and stopped myself from blurting out, "No I'm not, you're just learning it." Stopped in my tracks, I looked around the room. I was doing exactly what I had always described myself as doing. I was functioning as a facilitator of learning. I facilitated a process and the students taught themselves as they learned new things. I smiled inside and took the story home. Of the 34 students in the seventh grade class, these two made a huge difference in my Hour of Code experience. We all worked together. We navigated through it together. We learned together. We taught together. We explored. We coded. We rocked it! They rocked it! This whole experience brings brand new meaning to: Do you want to build a snowman? Just feel the power of CODE!